Today I had a pre-opt appointment at my plastic surgeon‘s office. I am a breast cancer survivor and going on 4 years, so I finally made the decision to have some reconstructive surgery to even things out. I’m a little nervous about going under the knife….even though they are going to take FAT from my stomach (joy oh joy!) to add to my breast…and a reduction on the other, it’s still a little scary. 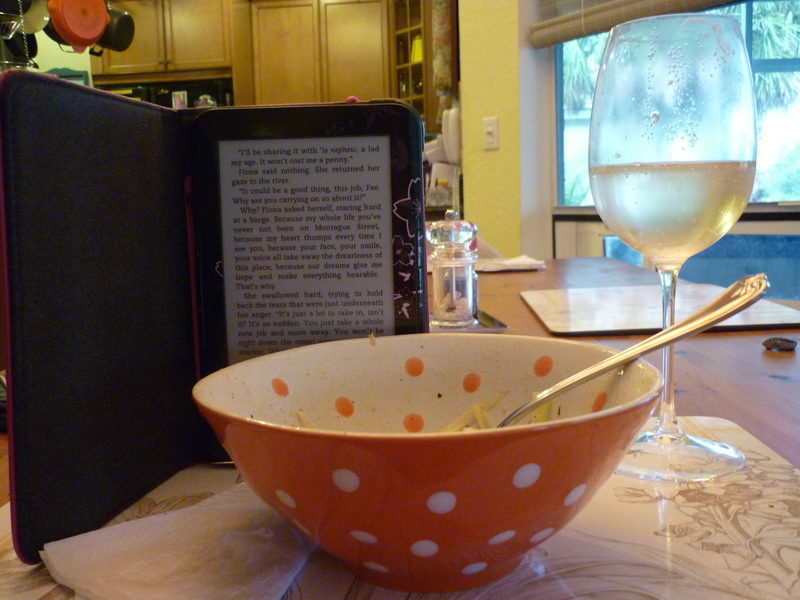 So I came home tonight from my appointment needing to let off some steam…and for me, that means COOKING. I'm starting off with some beautiful tilapia from Whole foods. Rub with some olive oil and sprinkle with salt and pepper. 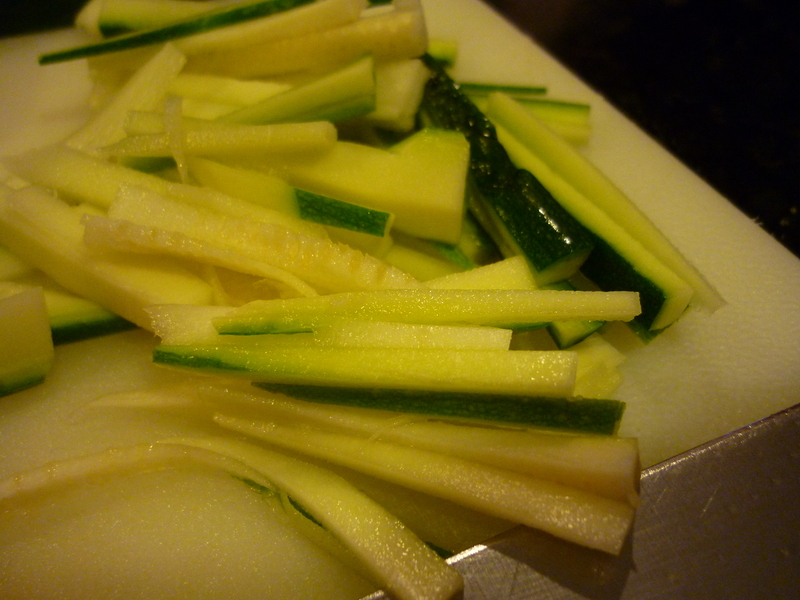 Take some zucchini and summer squash and slice into match-stick sized pieces. 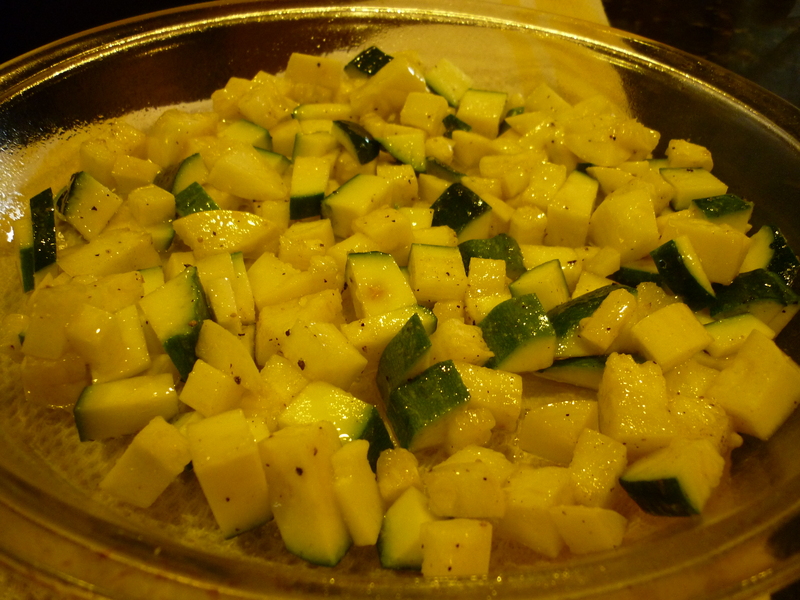 I had some squash left over, so I diced it up and tossed with olive oil, salt, pepper & garlic powder. I threw it into a pie plate to roast beside my fish. 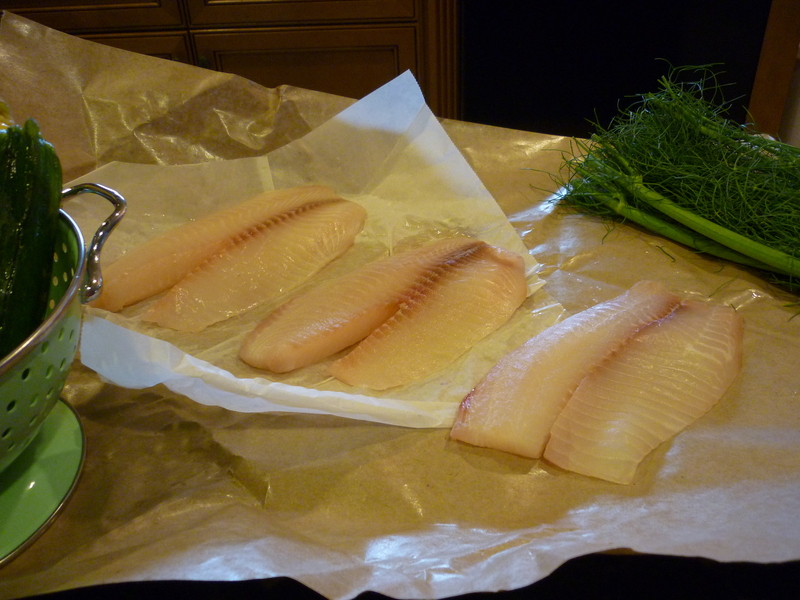 Back to the fish…sorry I got side tracked there with the left over zucchini. 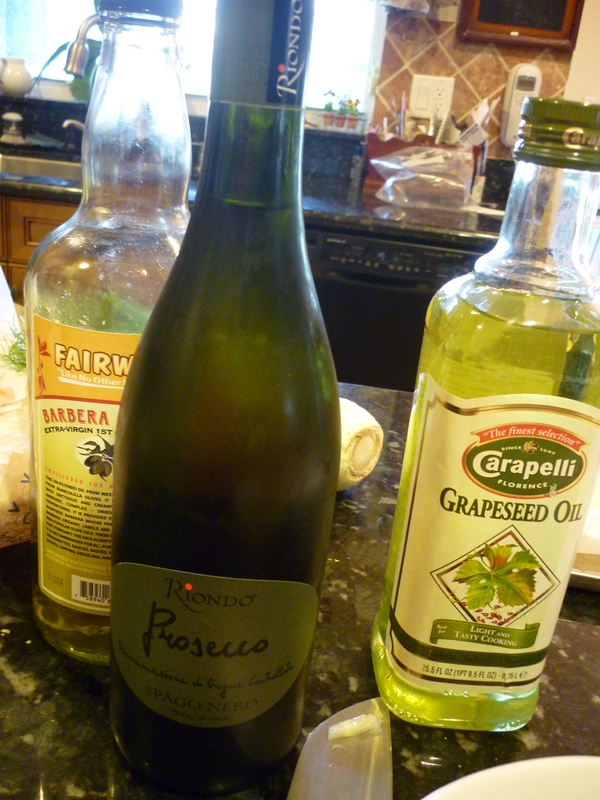 Toss all in a bowl with a dash of grapeseed oil (or olive oil), salt & pepper. Now isn't my polka dotted coral bowl pretty? Keep this handy. This is what we're drinking and so a little splash is in order when we start to assemble.Take a piece of parchment paper and fold it in half, add the fish and a scoop of the veggies on top. Add a pat of butter. 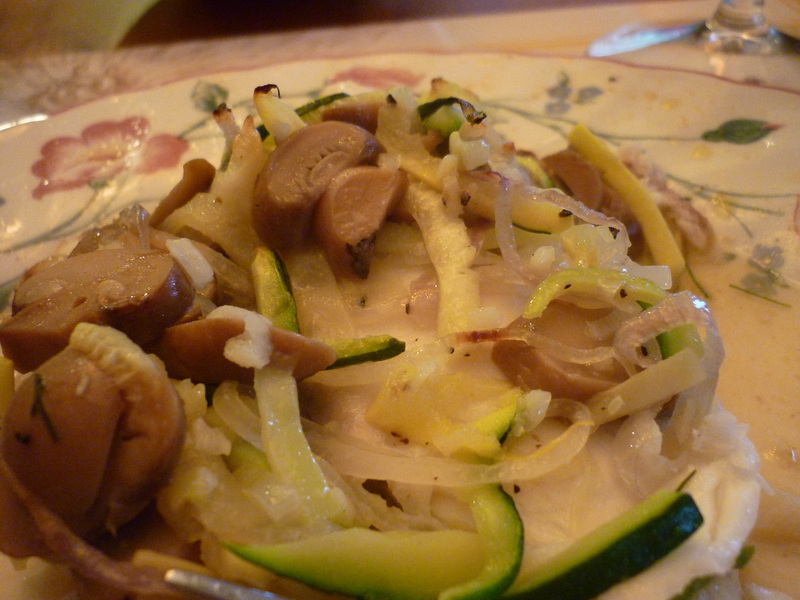 We have some mushrooms in there too and if I had carrots I would have added them as well. 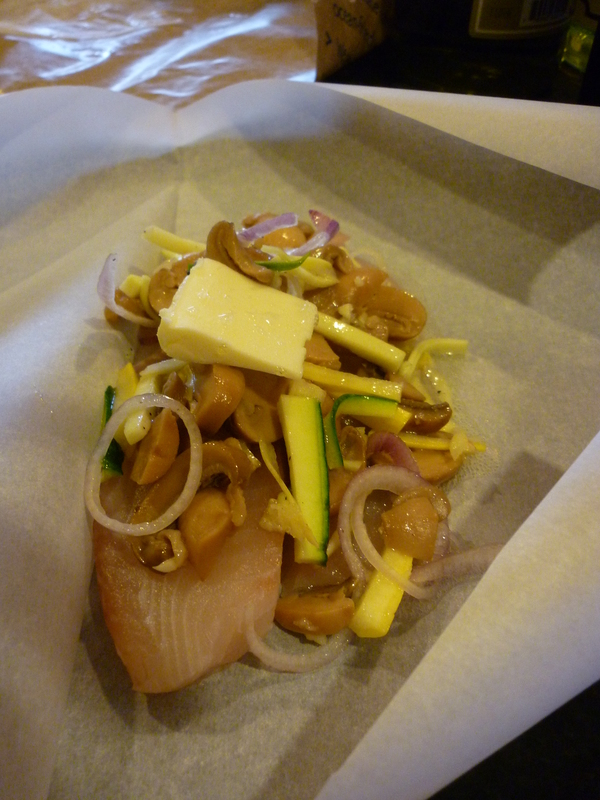 Take a piece of parchment paper and fold it in half, add the fish and a scoop of the veggies on top. 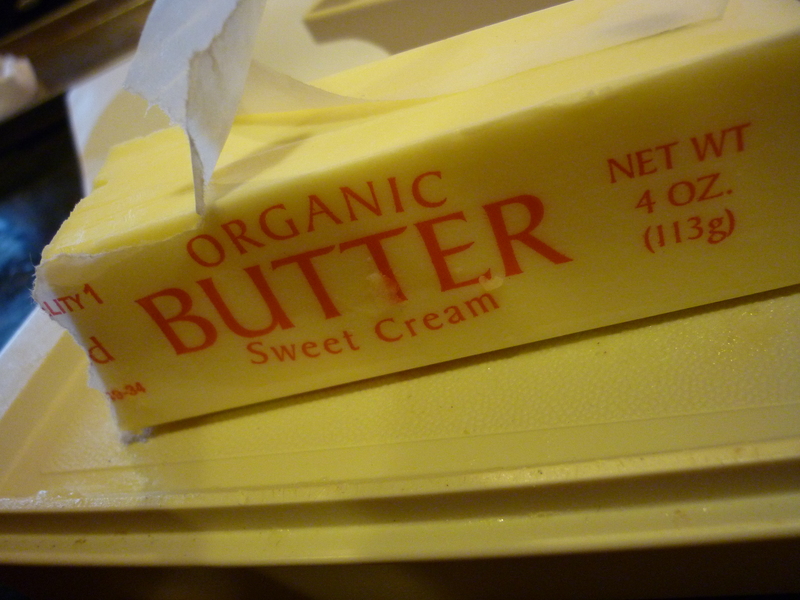 Add a pat of butter. 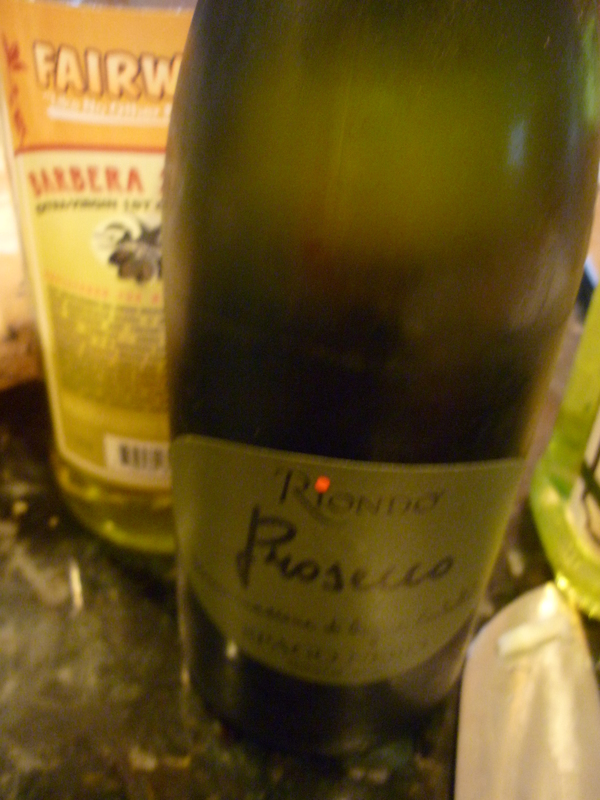 a splash of grapeseed oil and prosecco...which will create a lovely sauce within the packet. 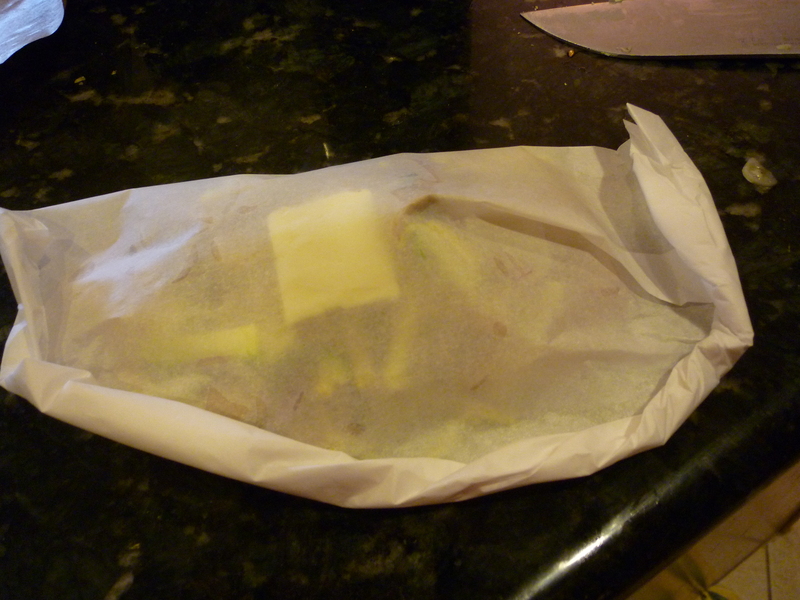 Quickly roll up the parchment paper like this to seal in the wine & veggies. Here are my little packets...3 in a row 'cause there's 3 of us. 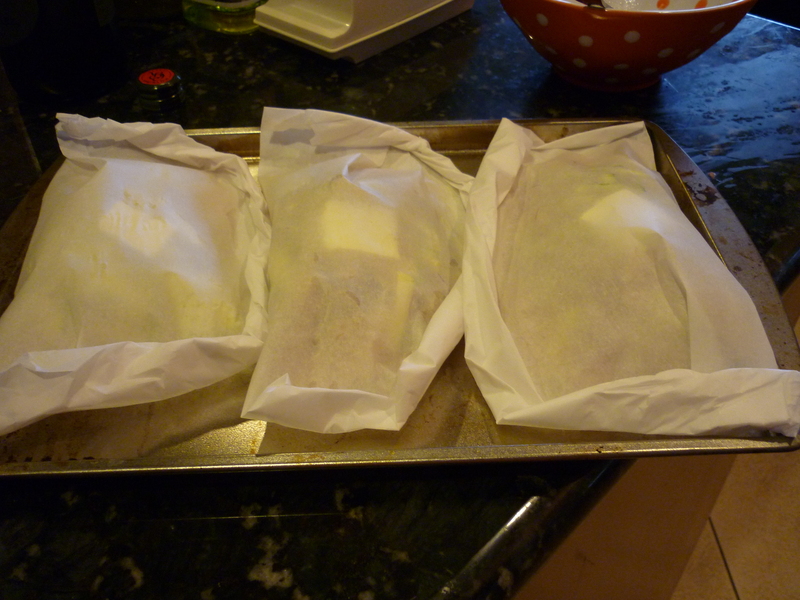 All tucked in a ready to be popped in a 375 degree oven for about 25 minutes. I need a side dish now. 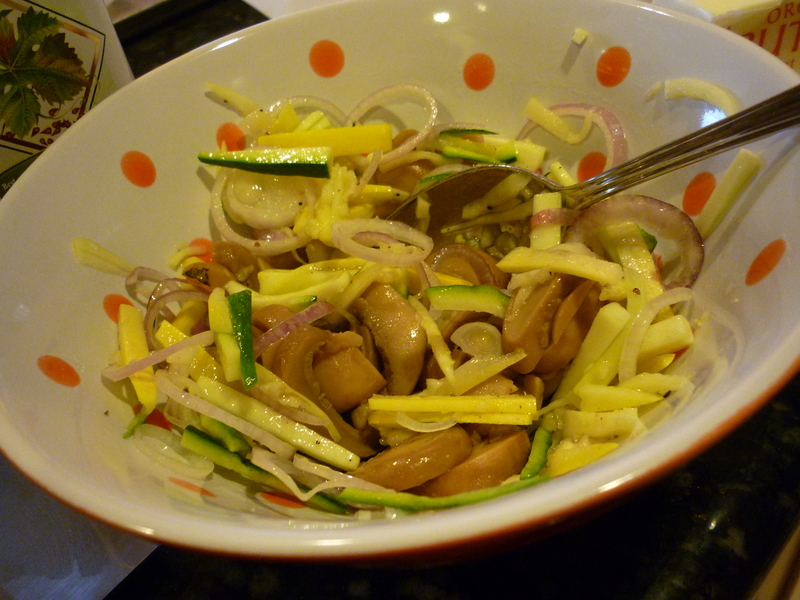 I decide to make a fennel salad. 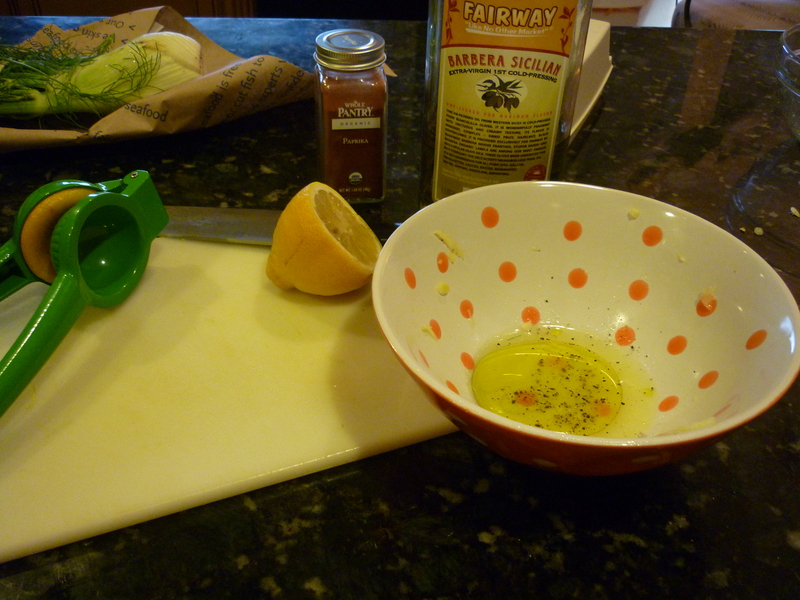 First, squeeze half a lemon and add to a dash of olive oil. 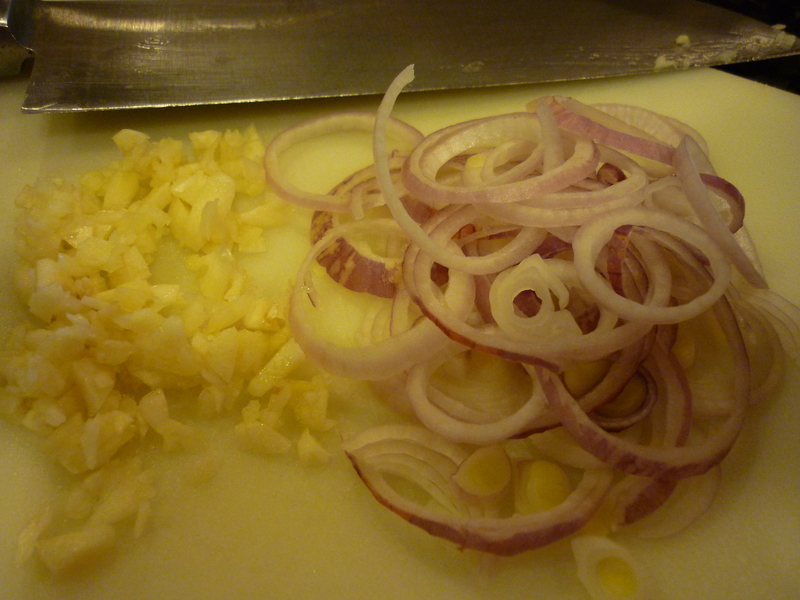 Whisk together with some salt & pepper. 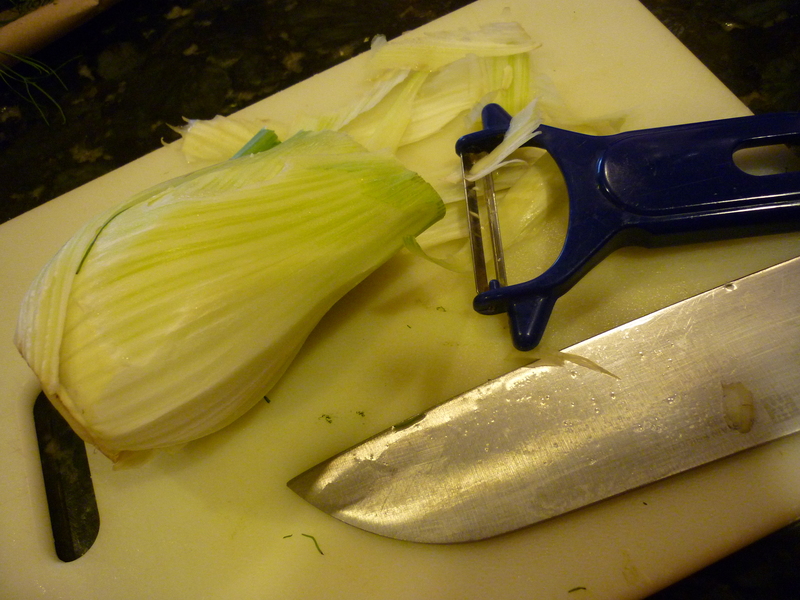 Use your peeler to take off some of that tough outer skin. 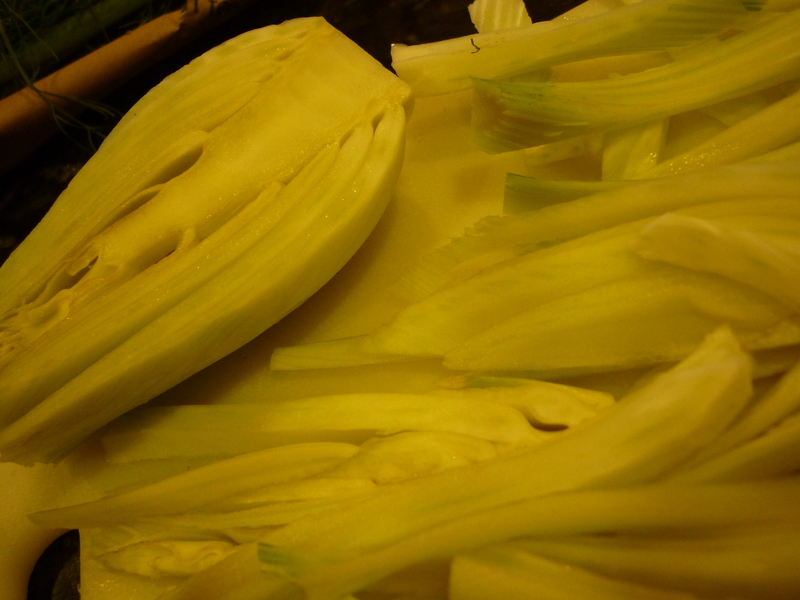 Slice up your fennel lengthwise. You can chop out the core as you go. Add it to the bowl (notice I re-used the pretty bowl again. I just added it to the existing remains of the veggies). Sprinkle with a little paprika, then toss together. Here's the finished packet torn open to revel the lovely fish and veggie mixture. 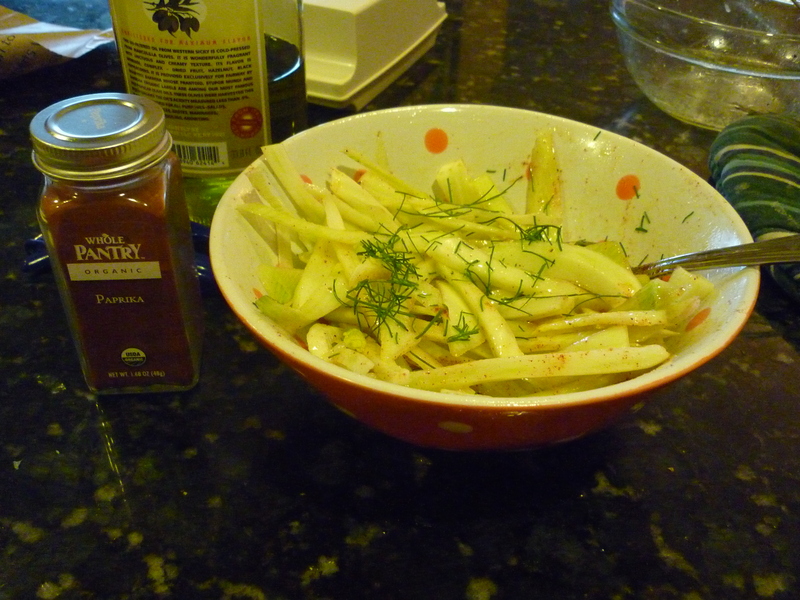 The fennel salad is based on a recipe by one of my favorite chefs, Laura Calder. Have to give credit where it’s due! Well that’s it for tonight- have a wonderful Holiday weekend everyone! This entry was posted in Cooking and tagged Black pepper, breast cancer, Condiments, cook, fennel salad, Garlic, Home, Laura Calder, Olive oil, parchment paper, polka dot, presecco, tilapia, zucchini. Bookmark the permalink. I hope it is not inappropriate for the husband to comment, but I just have to say that was a superb meal and Jacqui’s passion is the best hobby a husband could ever hope for his wife to enjoy. She is so talented and we her family really enjoy reaping the benefits of her awesome talent. I’m so happy you join my blog and i’m so glad i found yours can’t wait to try this my husband just loves this type of fish! I have a great recipe for salmon in the oven to if you ever want it! 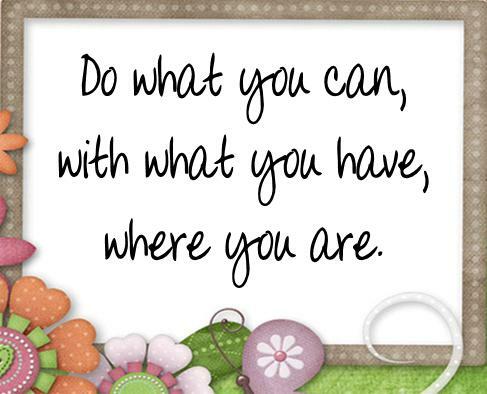 Good luck to you in your up coming surgery. Just discovered your blog – the food looks great and good luck with your reconsruction. This made me SO hungry for Tilapia! What a yummy dinner! This looks delish…I like fish, but I never really know how to prepare it…I think I could probably whip this up on my own…yum!